Loving Vincent | Movies | Palace Cinemas | Share our passion. LOVING VINCENT, the world’s first fully painted feature film, brings the paintings of Vincent van Gogh to life to tell his remarkable story. Every frame of the film, totalling around 65,000, is an oil-painting hand-painted by 125 professional oil-painters who travelled from around the world to the Loving Vincent studios in Poland and Greece to be a part of the production. 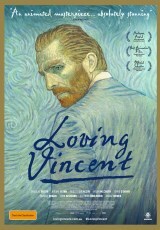 As remarkable as Vincent’s brilliant paintings, is his passionate and ill-fated life, and mysterious death. No other artist has attracted more attention than Vincent van Gogh. Variously labelled a martyr, a lustful satyr, a madman, a genius and a layabout, the real Vincent is at once revealed in his letters, and obscured by myth and time. Vincent himself said in his last letter: ‘We cannot speak other than by our paintings’. We take him at his word and let the paintings tell the real story of Vincent van Gogh. Loving Vincent was first shot as a live action film with actors then hand-painted over frame-by-frame in oils. The final effect is an interaction of the performance of the actors playing Vincent’s famous portraits, and the performance of the painting animators, bringing these characters into the medium of paint.